Rose hips, berries from the dog rose, can be made into a variety of jellies, preserves but it's most famous for making syrup. The berries need to be fully ripened before using. Rose hips have a very high content of vitamin C and in the past have been used for various aliments, the most popular being a preventative for the common cold. During the Second World War in England they were even collected on a massive scale to make rose hip syrup, which was used for expectant mothers and their infants. North America's early settlers also used the native variety (the meadow rose: Rosa blanda) to make a soothing syrup used for itches and sores. Chop rose hips finely and put into 1 litre of boiling water. Bring back to the boil. Remove from heat and let infuse for 15mins. Finely strain the rosehips till the bulk of the liquid has been collected. Return the pulp to the saucepan with the remaining water. Re-boil and infuse again for 10mins and then strain again. Pour the juice into a clean saucepan and simmer until the right consistency and then add the sugar, boil for 5 mins and then bottle. 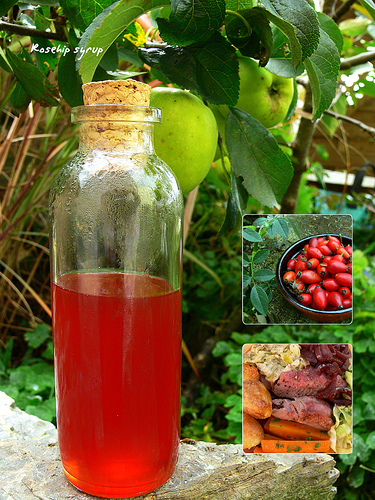 Rosehip syrup is good on ice creams and in smoothies. I've also read that, raw, rose hips are extremely high in vitamin C. They tend to stay on the cane all winter, so are easily accessible when needed, unless the birds discover them. I am dying to try recipes like this. Rose hips are easy find even virtually year round in Colorado. Thanks for posting this. We have wild roses dotting the open areas of our woods. I've used the petals in salads but until this year hadn't gathered any of the hips. I'd love to find enough to make syrup or jelly but so far I have just a handful. You have a wonderful blog. I'm happy to have found it.